WinterPad ointment forms a waterproof and protective barrier. It is for use on sensitive areas of the feet that can be more exposed to snow, ice, mud, or uneven ground. 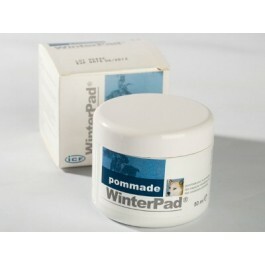 Winterpad protects and soothes, and has antiseptic properties. WinterPad can be used every day, both for prevention of and in the presence of redness, irritation or existing cracked pads. It is especially useful for working dogs such as hunting or sled dogs. Winterpad pommade s'utilise chez tous les chiens avant une sortie sur terrain hostile (neige, verglas, boue, terrains secs et agressifs, goudron...) et en particulier chez les chiens de chasse, de travail, de traineaux... Etaler sur les points de la région plantaire les plus sensibles et les plus exposés. Apply a layer of cream to areas of the paw that will come in contact with the ground and in between pads before the dog goes out into snowy. muddy or rough conditions.